Since the common Muslims and the elders at the Dar al-Ulum had taken up arms and ranked against the English in this fight for freedom, the English government was very much antagonistic to the Muslims, suspicious of and ill-disposed towards them. The Muslims activities and movements were being kept under strict surveillance. On this account a series of investigations, secret and open, in respect of the Dar al-Ulum continued for a long time. As such, in 1291 / 1875, the governor of Uttar Pradesh (formerly, the United Provinces), Sir John Strachey, sent a trusted man of his, John Palmer, to visit the Dar al-Ulum with the purpose of making secret investigations and report about the objective behind the establishment of the Dar al-Ulum and about the thought and activity the Muslims Ulamah [a term used for Scholars] were engaged in under the cover of this institution. The report that John Palmer prepared and the impressions that he gathered, he has described in detail in a letter that he wrote to a friend. The interesting and scholarly manner in which John Palmer has expressed his observations and impressions, comparing the educational condition of the Dar al-Ulum with the English universities, helps a good deal in understanding the educational position of the Dar al-Ulum. This incident occurred during the incipience of the existence of the Dar al-Ulum. It can be estimated from this as to what the educational standard of the Dar al-Ulum has been from the very beginning. While this letter consists of details of the Dar al-Ulum’s educational and some other particulars as well as review and criticism, it also brings forth an interesting album of the Dar al-Ulum’s features and its educational peculiarities, based on very profound impressions from the pen of a man,who had had an adverse view-point. Hence it seems apt that the whole text of the letter is reproduced here. “The Muslims here, at Deoband, have started a madrasah against the government. Go there incognito and find out what is taught there and what the Muslims are after”. Accordingly, on Sunday, 31st January, I reached the habitation. The village is quite clean, the inhabitants are courteous and pious but are poor and miserable. I wondered what kind of teacher he might be. “Persian is taught here”, he replied. When I proceeded from here, a man of medium height but very handsome was sitting at one place, with a row of older boys before him. Approaching near, I heard that the science of triangle was being discussed. It was my guess that considering me to be a stranger they would be startled, but no one paid any attention to me at all. I went near, sat down and began to hear the teacher’s lecture. My astonishment knew no bounds when I saw that such strange and difficult theorems of the science of triangles were being expounded that I had never heard even from Dr. Sprenger. I was agape with wonder. Meanwhile, the Maulvi sahib asked the students such a difficult question on the first grade of equation from Todd Hunter’s Algebra that I was in a sweat at my own knowledge of mathematics and I was astounded. Some students solved it correctly. From here I reached a third courtyard. One Maulvi  was teaching a thick tome of Hadith and was all smiles while lecturing. Climbing a staircase from here, I reached the 1st floor. There were elegant houses on its three sides and in the centre was a small courtyard in which two blind men were chattering. In order to hear what they were saying, I went near stealthily. I came to know that they were committing to memory some lesson from a book of astronomy. Meanwhile one blind man said to the other: “Brother! In yesterday’s lesson I could not understand the bridal figure properly. If you have understood it, please explain it to me”. The other fellow first stated the claim and then proceeded to prove it by drawing lines on his palm and when their mutual discussion was going on, I was wondering, bringing before my eyes the scene of Principal Breggar’s lecture. Getting up from there I went to a 5 doored room. Small children sitting very respectfully before the teacher were reading books of grammar. In Class III a traditional science was being taught. I came down by another stair-case. I was under the impression that the madrasah was only this much. By chance I met a man and sought confirmation of my impression from him. He said: “No. The Holy Quran is taught at another place”. When I asked him where?, he took me to the mosque. “Apparently it is an oppression, but in fact it is affection. To habituate children from the very beginning with hard work is the very essence of wisdom and in their interest and is very much needed to overcome the hardships to be encountered in future life. Nowadays only this thing of courage and tail has remained among the Muslims and it is because of this that some shattered pieces of Islam still remain with them”. I said that “Last year I had seen in newspaper  that four students had been awarded ‘the turban of proficiency’. Is any one of them present here?”. “Was the turban of proficiency tied on your head last year”? “It is”, he replied, “my teachers favor”. “What’s this book”? I asked him. “It is”, he said. “a technical book in the Arabic language. The manager of a press has sent it for translation. Its remuneration has been settled at Rs. 1000/-, I have been translating it for three months and nearly three-fourth of it is finished. The remaining, if it please Allah, will be completed in a month”. “How are these guns here”? I asked. “I am fond of hunting. From seven to ten I teach, from eleven to one I go on hunting and from two to five I translate”. I asked: “Why don’t you take up same service”? Rising up from here I came to the library. The librarian, welcoming me, showed me the catalogue of books. I was amazed. There was no subject on which a book was not there. He showed me another register. It was a muster-roll for the students and was written in a very neat hand. Out of the 210 students on the roll, 208 were present. I was about to get up when a young man with an incipient beard came and, having saluted, sat down. I asked him who he was. Then he placed three large registers before me and said: “Please see it; this is the account of income and expenditure for the whole year”. I saw that the account was written date wise with extreme soundness. From the abstract I learnt that at the end of the last academic year some money had remained in balance after the expenses. I wished to have a look at the books but the time was short and evening was about to set in. I was obliged to return. The results of my investigations are that the people of this place are educated, well behaved and very gentle. There is no necessary subject which is not taught here. The work that is being done in big colleges at the expense of thousands of rupees is being clone here by a Maulvi for forty rupees. There cannot be a better teaching institution than this for the Muslims and I can even go to the extent of saying that it even if a non-Muslim takes education here, it will not be without benefit. I had heard about the existence of a school for the blind in England, but here I saw with mine own eyes two blind men prove mathematical figures on their palms in the way it should be! I regret that Sir William Muir is not present today otherwise he would have inspected this madrasah with great zest and eagerness and would have given prizes to the students”. 1. He was Maulana Munfi’at Ali Deobandi, teacher of Persian who had been appointed the same year (A.H. 1291 / 1874) after the completion of his education. Initially he served as a Persian teacher and after some years was made Arabic teacher in which capacity he served the Dar al-Ulum till 1318 / 1900. 2. He was Maulana Sayyid Ahmed Dehelvi who was appointed second teacher in A. H. 1285 / 1868 and was made Vice-Chancellor on Maulana Muhammad Yaqub Nanautavi’s demise in A. H. 1302 / 1884. He continued on this post till A. H. 1307 / 1889. He was a matchless scholar of the time in mathematical sciences. Maulana Muhammad Oasim Nanautavi remarks “The Beneficient Lord has endowed Maulavi Sayyid Ahmed with such ability in and affinity with the mathematical arts that the inventors of these sciences too perhaps had had this much only.” (Report for A. H. 1293 / 1876, p. 13). 3. This is a reference probably to Maulana Muhammad Yaqub Nanautavi, the vice-chancellor. From the very inception he had been appointed to this post. – Sayyid Mahboob Rizvi. 4. That is Hafiz Namdar Khan, a resident of Bassi, District Muzatfarnagar. In the second year of the establishment ot the Dar al-Ulum, when the Quran class was started in 1284 / 1867, he was appointed its teacher and for nearly 55 years i.e till 1339/1920, he taught this class and produced a vast circle of Huffaaz including several teachers of the Dar al-Ulum. 5. This was the earliest stage of the life of the Dar at-Ulum but it seems from John Palmer’s sentence that the conditions and particulars of the Dar al-Ulum were published prominently in the newspapers, which means that even in those incipient days the Dar at-Ulum was deemed to have achieved a central and distinguished position. 6. Most probably he was Shaikh al-Hind. He had completed his studies in 1290/1874 and had been appolnted as teacher without pay in A.H. 1291. Among those who graduated in A. H. 1290 / 1873, Shaikh al Hind alone was an inhabitant of Deoband. And he was very fond of hunting also. It is regrettable that the book under translation referred to by John Palmer could not be traced. Note: Shaykh al-Hind Maulana Mahmud Hasan [may Allah be pleased with him] is not to be confused with another great Islamic scholar, Mufti Mahmud al-Hasan popularly referred to with the title ‘Faqeeh ul Ummah’ meaning ‘Jurist of the Muslim community’ who is also a graduate of Deoband. – Blog author. 7. That is Maulana Rafi al-Din, Vice Chancellor of the Dar al-Ulum from 1284 / 1867 to 1286 / 1869 and again from 1288 / 1871 to 1308 / 1888. This letter is a translation from the Urdu version of John Palmer’s letter. As a spy he might have known Urdu and Persian well. Unfortunately the compiler of this history. Maulana S. M. Rizwi died of heart failure on 25th March, 1979 otherwise he could have supplied the original English text, if there was any. – Murtaz Husain F. Quraishi, the translator of the book into English. This is the outcome of the fear of Allah and being conscious of accountability in the court of Allah. The following is a must read for all and hope to be a lesson for many in our society—-Mufti Ebrahim Desai. Gulf News-Manama: An expatriate working as a street sweeper in Makkah saw his life change in a blink during the Haj season after his estranged brother sought to make amends for wronging him by returning his share of the family fortune. The Bangladeshi man was sweeping Taneem Street in Makkah when an old man wearing the Ihram cloth of Haj pilgrims crossed the busy road and embraced him warmly much to the perplexity of passersby. However, the sweeper returned the embrace, indicating his familiarity with the older man. The embrace in fact was between two brothers who had not seen each other for more than five years in the aftermath of a bitter dispute over inheritance rights, Saudi news site Sabq reported. The two men were from a wealthy family in Bangladesh, but the older brother had refused to give his sibling his share of the inheritance estimated at 17 million Saudi riyals (Dh 16.64 million) in cash in addition to several properties. The older man even managed to have his younger brother sent to prison whenever he asked for his share. The younger brother, disappointed and dejected, opted to leave Bangladesh and work as a sweeper in the holy city of Makkah. As it turns out, the sweeper has become a millionaire in his home country. He told the people who gathered around him and his brother that he had forgiven his brother who had apologised profusely for mistreating him and that he was ready to return home. The older man said that he had been diagnosed with cancer and that he was not sure how long he would live. He reportedly looked for his brother in several places to ask for his forgiveness and make amends for all the years of deprivation he was forced to endure. He even offered financial rewards to whoever could help him locate his brother. According to the news site, the younger brother said he was ready to forget the past and move forward with his new life. “I will always be kind with the poor and the needy,” he said. “I have learned a lot about deprivation and poverty in the last five years. I will always be fair with everyone after I lived through years of injustice,” he said in Arabic, a language he learned during the time he spent sweeping the streets of Makkah. Egyptians often see themselves, understandably, as the hub of the ancient world and as the cultural and intellectual capital of the Arab and Muslim world. This sense of pride, in the last few weeks, was lifted into the clouds (and, for some, dipped in the mud) with the triumphant arrival of Dr Muhammad Mursi into the presidential palace (without a job description and without a parliament). This was possible with the “approval” of 20 generals hugging the coffers of the country whilst simultaneously declaring themselves beyond the reach of presidential powers and having the right to choose and veto who will write the new constitution. Congratulations to all! Alf mabruk! Aside from the multiple ironies in this new emerging state of affairs, there has been another interesting series of developments in Egypt: the intensification of what used to be referred to in the 90s as “psych-war” (psychological warfare). Psych-war is not a new phenomenon but the intensity with which it has erupted on the Cairo scene points to such a sense of desperation in certain quarters that it has caused the “standards” of the game to drop. Let me explain. But, as we know, when people become desperate, they do strange things and in Cairo they did just that. The Egyptian media became so saturated with all sorts of wild accusations against ulama and against politicians leaning towards Islam that it began to look like a comical interlude in a shanty town circus. For example, when one popular scholar declared that Egypt was not in need of US aid, he was promptly and falsely accused, on prime time TV, of living in palaces and having trillions of pounds stashed in Swiss bank accounts. This desperate trend of false reporting became so pervasive that it did not spare even the new president. Dr Mursi is now suing a TV channel for broadcasting fabricated (would you believe it) “audio recordings” of an interview he is supposed to have given to a reporter in Cairo. The latest fabricated news story is that Dr Mursi has plans to visit Iran in August. This has been strenuously denied by the president’s office. Among this slew of lies, fabrication and false reporting, there is one particular story that has reached the shores of Britain and America and is now causing confusion in the minds of many Muslims. I suspect there will many more such stories in its wake. Apparently, Al-Azhar University had granted a first class PhD degree to a student for a thesis arguing that hijab was not part of Islam. The thesis was allegedly written by someone called Sheikh Mustapha Mohamed Rashed. The report was beamed around the world on major news wires and made headline news in agencies where the Christianization of Islam is considered “the main mission” of our time. The “reformationists” and confused Muslim feminists heralded the report as confirmation of their long-held position on hijab being un-Islamic. Facebook and Twitter were buzzing with “Dr Mustapha’s thesis”. When I received an email about this mysterious Sheikh Mustapha Rashed, who had now removed hijab from Islam, I remembered reading a while ago a strange fatwa on the permissibility of wine and pork in Islam which was linked to a similar name. After checking my records, I realised that it was this same fictitious individual who had also argued that the Bible was to be followed by Muslims. It is therefore no surprise that it has now emerged that the entire report on the Al-Azhar hijab thesis was completely fabricated. According to an official statement from the University of Al-Azhar by Al-Shaikh Usama Al-Sayyid, “No one by the name of Mustapha Rashed was granted a doctorate, nor did any student submit a thesis on this subject and it is literally impossible for the University of Al-Azhar to grant a PhD for such a strange thesis that is entirely against the teachings and principles of Islam.” He also stated that the officials of the college of Shari’ah are surprised that such a report could spread so far and wide merely on the basis of a Facebook post. He also noted the timing of the report, which was released during the elections when there were ongoing debates about the implementation of Islamic law in government. The lesson in all of this is that we should be extremely cautious about the sources of our deen. When we have an illness in our bodies we go to the professionals for treatment. We go to our GP to seek help when dealing with our bodies. Our souls also deserve to be treated with the same value and respect. If instructions from websites are not to be trusted when it comes to the treatment of our bodily illnesses, then why are they fit for our faith? If we ask ourselves: would I buy a prescription drug which a website was selling me? The answer would most likely be “no”. We would say that there are all kinds of scams on the internet, unscrupulous companies producing fake medicines that could harm me if I took such drugs bought over the internet. Then why is it that we as Muslims – a people with traditions and knowledge verified by historically unparalleled chains of certification (isnaad) – have become so gullible as to take prescriptions for our deen from the internet? The internet as a medium has its merits but it also has grave dangers, false reporting being among these. To remain safe as Muslims, we must not abandon the system of isnaad certification. Check and double-check your knowledge with living scholars! In the days and months to come, we are likely to see an increase in the flood of false fatwas, baseless reports and lies on a grand scale. Our souls deserve at least the same protection we afford to our bodies. Among the prophecies of the Messenger (sallallahu alayhi wassallam) is that towards the end of time, lies and falsehood will become profuse. Do not google your soul away! It is too precious. Make plans to cleanse it. The season for purifying our souls is coming. Prepare for Ramadan by fasting in Sha’ban. May Allah grant us the benefits of guidance in His Revealed Words. Ameen. A living Pious, Shaykh Zulfiqaar (db) recited this heart-melting verse in one of his lectures: Qul Ya ’Ibadiyallaizi-na asrafoo…. 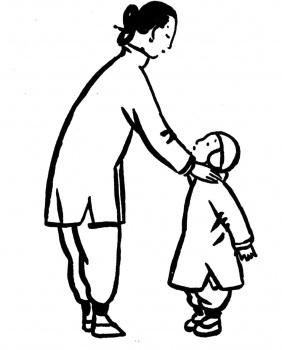 Shaykh Ibnul Qayyim (R) was once passing by a lane where he suddenly saw a mother scolding and reprimanding her 8/9 years old child and in intense anger, the mother pushed her child forcibly toward the road; forbade her child to enter into the house anymore and told him to leave her forever. Finally, the mother got into the house and shut the door. The gloomy young boy absorbed into some thoughts and walking off a bit far toward the crossing, he waited for a while and reflected on something again. Right after thinking something, he walked back to his house and lied down at the doorstep. After a long time the mother opened the door and upon seeing her son she became furious again! Awakening him, she warned him that she would not like to see his child’s face anymore and he should leave the place. Listening to the mother’s words the child replied, “Mother! I thought that I would go away from you; I thought I would earn my living through begging or do some petty job of a cobbler or become someone’s servant. Reflecting on these, I walked till the crossing but then it came into my mind that nothing compares to my mother’s love; in fact, your love has no substitute! I couldn’t continue moving forward ruminating this point. Therefore, I had returned. Whatever action may you take against me, I am here mother! These words of her child caused the mother to pacify and calm down immediately! She grabbed and hugged her child and accepted him with great compassion.